Last year at IFA we took a look at the then-new Moto X4, checking out (among other features) its Wireless Sound System from Tempow, allowing it to sync audio across multiple Bluetooth speakers or headphones at the same time. This week we got to learn about the next evolution of Tempow's system, TAP Smart, shown off with the help of the Android-powered Keecker home robot. Tempow is all about leveraging cheap, readily available Bluetooth audio devices to enhance the capabilities of existing systems. We already saw the start of that with the Moto X4, and now the company's got smart speakers and home assistants squarely in its sights. While it's hoping to attract the attention of Google or Amazon for integration with Assistant or Alexa devices, it's getting things started with Keecker. 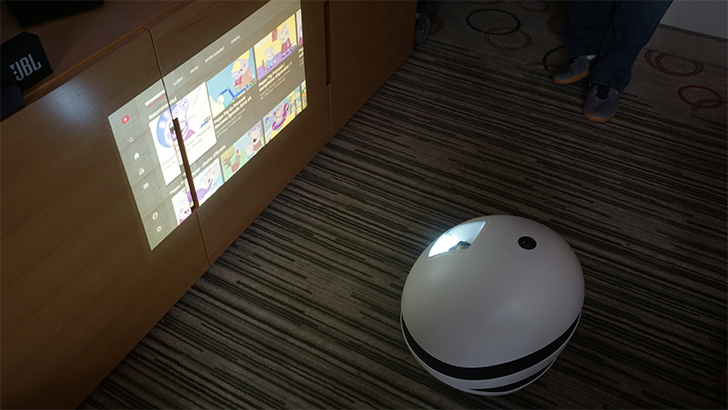 The Keecker robot is at its core an Android TV device, basically a projector on wheels. It can mosey around your house, pumping out tunes on its internal 4.1 speaker system, and casting video content onto nearby walls and ceilings. And with both Google Assistant and Amazon Alexa support, it's just the sort of product Tempow's interested in. With a new software update, the Keecker will be able to extend its audio capabilities by linking to nearby Bluetooth speakers, spreading its audio output even further. If you've got a number of speakers dotted about your living room, Keecker will be able to stream to all of them, broadening the soundstage and increasing stereo separation. Tempow's tech can even selectively route audio components to specific devices, using your small Bluetooth speakers as tweeters and tapping the Keecker itself for the subwoofer role. That's neat, but the really interesting stuff concerns what Tempow would like to see happen next. The company is pursuing the idea of getting its Bluetooth stack into more types of connected-home devices, with smart speakers and TVs at the top of that list. Were a firm like Google to bring Tempow's software to the Google Home family, you could stream its audio to a bunch of additional Bluetooth speakers, sure. But beyond that, the company's interested in using the microphones present on many Bluetooth speakers to turn them into what are effectively remotes for your primary smart speaker, relaying commands and receiving responses. With televisions, Tempow hopes to give users a lot more versatility for how they listen to their entertainment. 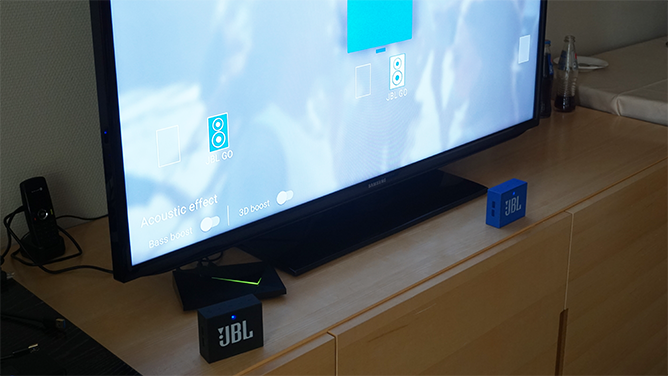 We got to experience a TAP TV demo running on Shield Android TV hardware that allowed users to set up their own wireless mutli-speaker system, configuring which devices should carry which audio channels. More than that, it can even deliver separate audio streams to individual Bluetooth units, so viewers who speak different languages can watch the same video together, but each receive a native-language audio feed on their own headphones. Or for users with hearing issues, the system could deliver custom-balanced audio that's adapted to their specific needs. All of this, though, requires getting other companies on board, and Tempow hopes that showing them what's possible with the Keecker robot may inspire them to integrate this Bluetooth system for themselves. For now, the team's got some good ideas with a lot of potential, but it remains to be seen just how ubiquitous its tech might become. August 30, 2018 - Paris, France - Tempow, creators of software-only solutions to enhance Bluetooth protocols for hardware manufacturers, today announced a new line of Tempow Audio Profile applications, dubbed “TAP Smart” for smart home assistants and Bluetooth speaker systems like Amazon Alexa and Google Assistant. The suite of software enhancements embed directly into the smart speaker, allowing users to stream a single sound source to as many as four additional Bluetooth speakers or headsets. Tempow’s first hardware partner for TAP Smart is Keecker, a voice-enabled multimedia robot that runs on Android TV with access to Google Play Store and Google Assistant, and functions as an Amazon Alexa smart speaker. Whereas other smart speaker sound systems rely solely on WiFi, Tempow combines WiFi with Bluetooth to offer a truly hardware-agnostic solution that requires no device modifications. This is a critical differentiator, as Tempow’s technology is substantially less expensive than a WiFi-only solution and also allows users to take their sound systems with them wherever they go. The Tempow Audio Profile supports multiple channels - not just stereo links - meaning users can create their own 5.1 or 3.1 speaker surround sound system with Bluetooth speakers from any manufacturer. Additionally, because it is a software-only solution, Tempow’s technology will continue to work seamlessly across every generation of Bluetooth speakers, regardless of what chipset the device uses. Tempow is building technology to enhance voice transmission capabilities for the assistants on smart speakers, which will complement its audio solution. Its upcoming mesh network will enable voice detection on all devices, so users can interact with their assistant through whichever speaker is closest. For more information please visit www.tempow.com. Tempow is research and design lab focused on pushing the limits of Bluetooth technology. Their first product, the Tempow Audio Profile (TAP) is an updated Bluetooth protocol allowing any Bluetooth chip to stream audio on multiple Bluetooth audio outputs simultaneously. It is a 100% software solution, and works with any brand of Bluetooth speaker on any chip. The company closed a Series A round of venture funding led by Balderton Capital, and has global partnerships that bring Tempow-enhanced Bluetooth to millions of around the world. Tempow is headquartered in Paris, France with extended operations in Seoul, Korea and Shenzhen, China.